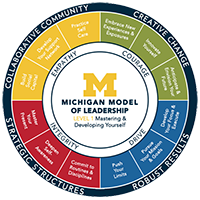 The Michigan Model assessment is a part of the curriculum for every Michigan Ross degree program. Most students will receive training during their orientation; BBAs will take the assessment during their BA200 course. 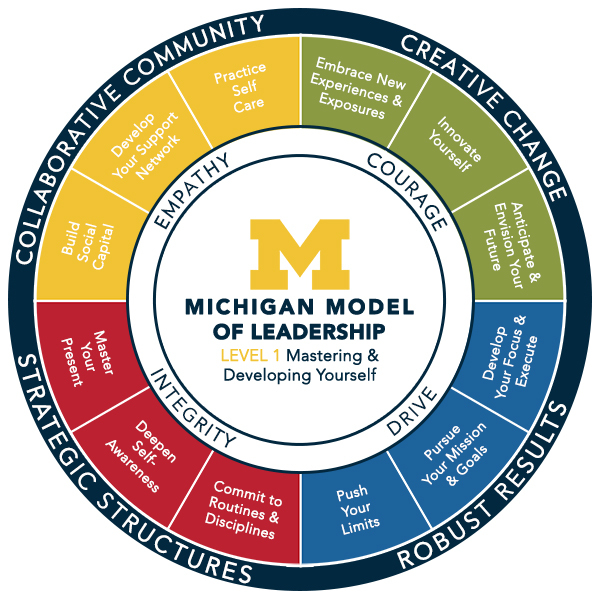 If you are affiliated with the University of Michigan and you are interested in taking the assessment, please contact us about a custom workshop. 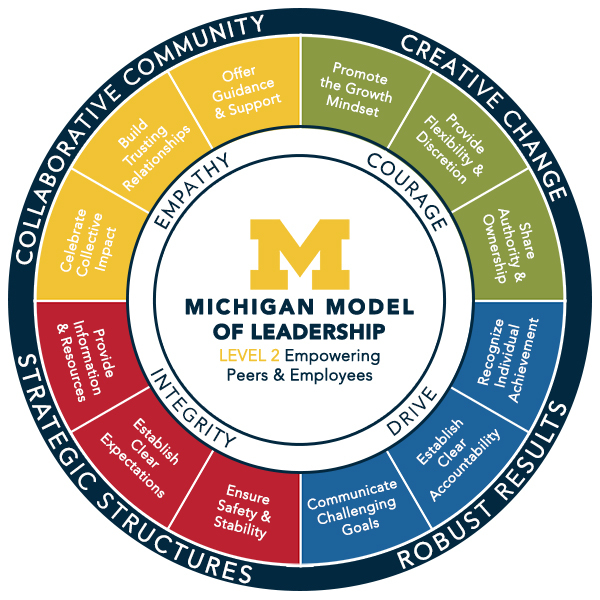 The Michigan Model of Leadership is based on a half-century of empirical research and real-world practice. On the one hand, it is influenced by a wide range of revolutionary ideas developed by faculty at one of the most innovative universities in the world. On the other hand, it is designed to be accessible and useful to practitioners across industries, sectors, and geographies. It simplifies enormous complexity by utilizing the Competing Values Framework (CVF), which was developed by Robert Quinn, Kim Cameron, and other Michigan faculty, and has been widely adopted by thousands of businesses and leaders around the world. It is now the foundation for consulting practices, executive education courses, and numerous leadership development programs. In 2003, it was recognized by the Financial Times as one of the 40 most important management frameworks in history. The CVF acknowledges a fundamental paradox of leadership that is tied to two key tensions found in all organizations, teams, and individuals. The first is the need to foster things like collaboration, harmony, and positive relationships (yellow) on the one hand, and the competing need to drive effort, goal achievement, and results (blue) on the other. The second is the urgency with which leaders must establish stability, control, and integration (red), while at the same time aggressively pursuing innovation, change, and learning (green). Navigating these fundamental tensions and achieving the appropriate balance is the stuff of leadership. “Know thyself” is one of the world’s oldest leadership tips, and it’s more relevant than ever in today’s complex, dynamic world. In fact, it is a cornerstone in the practice of emotional intelligence, authentic leadership, and other teachings aimed at helping professionals thrive in today’s world of work. At the same time, there’s growing recognition and a body of research demonstrating all the ways in which self-knowledge can become an anchor in the best and worst senses of the word. It provides the positive benefits associated with greater attunement to strengths, values, virtues, and higher calling, but if we become too rigid in our sense of self it can hold us back from change, learning, and growth. 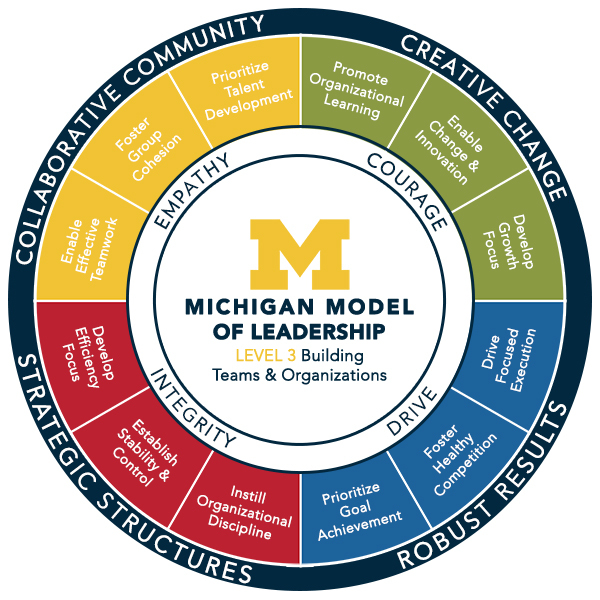 Guided by a wealth of faculty research, the Michigan Model challenges us to become more authentic by developing our integrity (red) and purpose-centeredness (blue), while also driving our own evolution through generative connections with others (yellow) and lifelong experimentation and learning (green). Offered in the Fall and Winter semester, this series of two workshops is designed to help you unlock your personal capabilities and increase your influence. Legacy Lab is filled with reflective activities, powerful stories, and meaningful engagement with your peers. The term empowerment has been misused, misunderstood, and discarded in many circles. Yet we know from definitive research (and lived experience) that we can dramatically improve the performance of our organizations by simply increasing the number of people who act like owners: who shift out of the victim mentality, become problem solvers, take proactive action, and perform courageous acts of leadership. 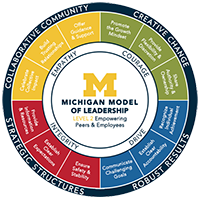 The Michigan Model offers a clear, research-based approach for creating a more empowered work force. It requires leaders to offer continuous vision and challenge (blue), while also providing consistent guidance and support (yellow); give the gifts of flexibility and broad discretion (green), along with the clarity, resources, safety, and security (red) that build confidence and enable creative action. Crisis Challenge is an action-based learning experience which creates opportunities for you to work on a multi-disciplinary team to solve a business and media crisis. You’ll have the opportunity to empower your team as you create a strategy to tackle the crisis, receiving feedback from experts along the way. The Ross Leaders Academy is our premier leadership development community for select students across campus. During the course of the year, you’ll make leadership development a primary focus. You’ll learn from a diverse set of peers, receive team executive coaching, and engage with 30+ years of powerful research and ideology.